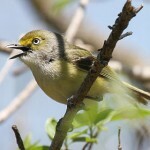 Song similar to Red-eyed Vireo’s, but generally slower, thinner, and higher in pitch. Description: Sexes similar. Greenish-olive back with contrasting gray cap; variably yellowish below with whitish belly; dull grayish-olive wing bar; dull white eyebrow; and dark eye line that extends through lores. Most fall adults are completely yellow below. Habitat: Found in open second-growth woodlands, old burned-over wooded areas and clearings, and stream or lake-side willows and alders. 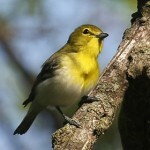 Where in Nebraska: Uncommon spring and fall migrant in east, occuring west to at least Garden County. No breeding records for Nebraska. 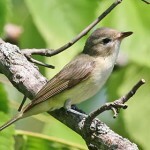 Status: The Philadelphia Vireo is not only uncommon in Nebraska, but throughout its range. 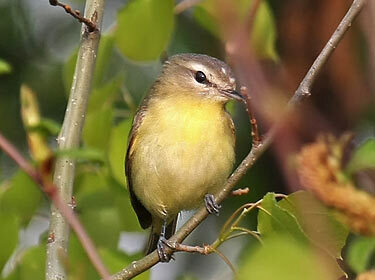 Fun Facts: Philidelphia Vireo’s can co-exist and flock together with Red-eyed Vireo’s by altering their behavior to exclude them and forage in areas the Red-eyed Vireo’s will not.